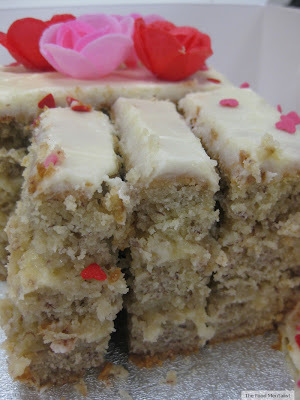 This recipe is my all time favourite cookie recipe and I have been making it for abut 20 years now. I must warn you though that once made, they are hard to stop at just one. The recipe was handed down from my great aunt and what I love about them most is the combination of crunchy cornflakes and dark chocolate chips. The addition of sultanas is purely optional but it does make for a great chewy component. In this latest batch I chose to omit them as I find sultanas can be quite polarising when it comes to some. Heat oven to 180'C ( ours is fan forced). Cream together the butter or margarine with the caster sugar. Then add the vanilla. Fold in the sifted self raising flour in batches until it has all been incorporated to the mix. Next add the chocolate chips, sultanas and 2 cups of cornflakes and mix well. 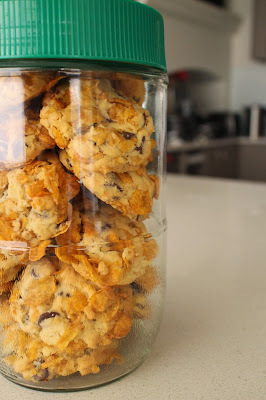 Pour the remaining 2 cups of cornflakes into a bowl and using a desert spoon form cookie dough balls and roll them in the cornflakes to coat, crushing some of them into the dough ball. Place the heaps cookie dough balls onto a tray lined with baking paper and bake in the oven for approximately 12-15 minutes or until lightly golden. You will find the cookies have flattened out somewhat. Cool on trays for 5 minutes before transferring to a wire rack until completely cool. Store in an airtight jar or container at room temperature for up to 5 days - if they last that long! Do you like sultanas in your cookies? I'm not a big fan of sultanas in cookies but I do like a good oatmeal and raisin cookie!